Two-person show with Daisy Cook. Catalogues for both painters are available. Tim Nicholson catalogue, with a foreword by Vivienne Light (see below), at £10 plus £1.40 p&p. More artist biographical details follow the images below. The paintings in the exhibition can be viewed below and are available to buy or reserve now. Please call 01308 459511, email gallery@sladersyard.co.uk or reply to this page to enquire about a painting. If the painting you like is already reserved, please let us know so that we can call you if it comes free. ‘Tim Nicholson’s personal sense of colour and liveliness of observation yield images of delight, imbued with the Nicholson family aesthetic.’ Richard Morphet, Curator at the Tate Gallery 1966 – 98, author of a number of books about the Nicholson family. Born in 1939 to the hugely influential Nicholson family, Tim lays no claim to special attention from his family. Yet his work shines with the bold, fresh and playful ability to reduce his subjects to an essential simplicity which is so distinctive of the Nicholson’s. In this exhibition we gather pictures from throughout his life in a major selling exhibition. The exhibition includes around thirty works, from the very large to the very small, the majority of which have never before been shown. Tim lives and paints near Cranborne in Dorset. He was brought up there by his mother, EQ Nicholson, a talented fabric designer and artist. During the war the artist John Craxton who was 17 in 1939 came to live with them. He and EQ painted everything that was around them creating a strong sense of place which continues to be an important element of Tim’s work. John Craxton’s work and a number of illustrated letters to Tim’s mother EQ are currently on display at Dorset County Museum. Tim’s father Kit Nicholson was away in the war from when Tim was born. He returned to work as a modernist architect in London, coming home to his family for weekends. He died in a gliding accident in 1948 when Tim was only 9. Kit’s brother, Ben Nicholson was a good friend to EQ but not especially close to his nephew. The painter William Nicholson was Tim’s grandfather but sadly he suffered from senility in his old age and never really knew Tim. Yet these important figures, along with Winifed Nicholson and Christopher Wood, consciously and unconsciously had a lasting influence on Tim which is clearly evident in his paintings. Tim went to Bryanston on an art scholarship. There he spent all his time in the artroom with the children of a number of other well-known artists who happened to be there at the same time. 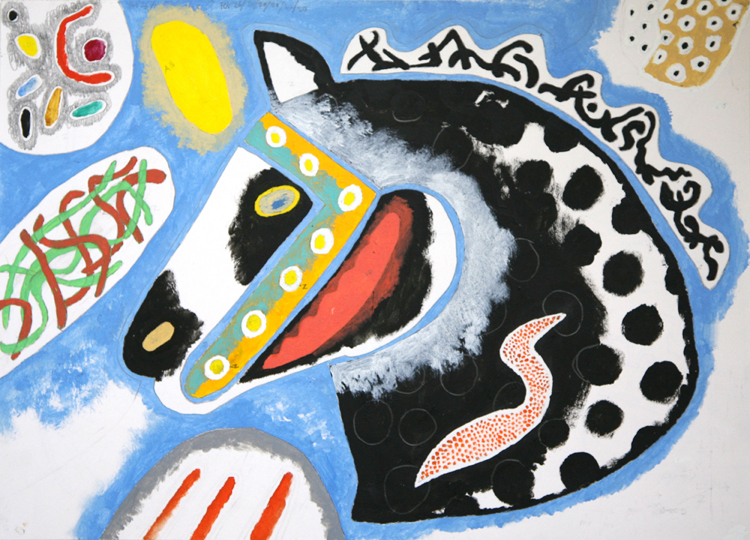 They were allowed a free hand and spurred each other on, painting, drawing and experimenting. After a false start studying Zoology and Biology at Trinity College Dublin, Tim went to the Architectural Association. Not one to follow the herd, Tim found he ‘had far less grand taste. One likes things like cigarette cards.’ Nevertheless he practised as an architect until 1980 when a cycling accident left him very weak. He amused himself by drawing and by the time he was better he had decided he needed to be an artist. Solo shows in London in1985 at the Charlotte Lampard Gallery and in 1990 at the Michael Parkin Gallery were followed by group shows in London and Dorset. In 2009 Tim married Catherine Row and entered one of the happiest periods of his life. 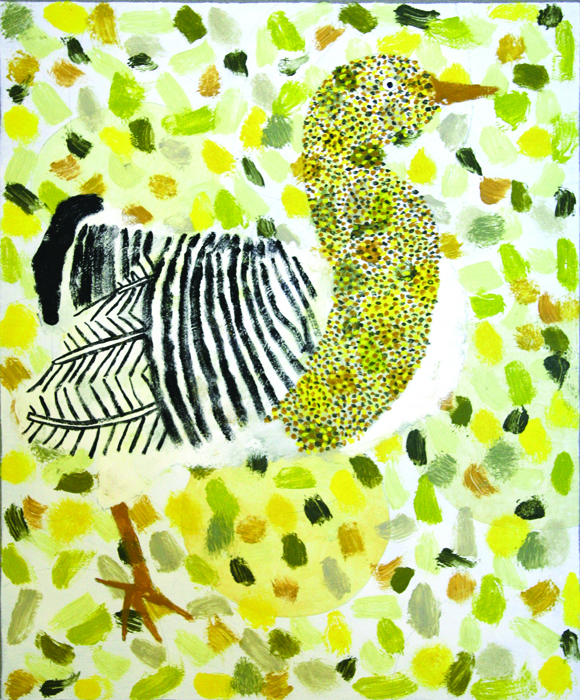 Catherine has encouraged him to paint and to show his work. He treats painting as an extension of playing. 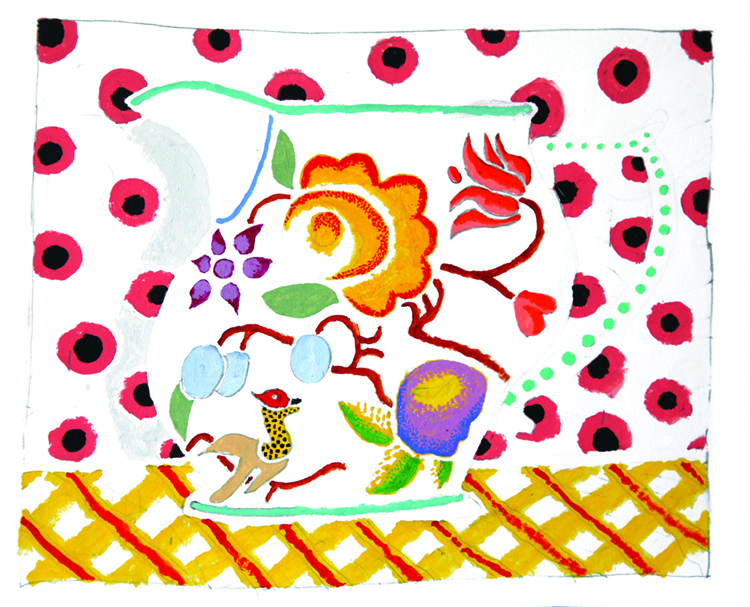 ‘I like making up rules and seeing if they work, then adjusting the rules, putting colours next to each other.’ Inspired by patterns, children’s books, cards, pictures of birds and animals and painted ceramics, he paints the objects and landscape that surround him in bold, witty and youthful colour.